Enjoyable action blockbuster with superb set-pieces, a witty script, assured direction from Pixar’s Brad Bird and a trio of terrific performances from Tom Cruise, Simon Pegg and Jeremy Renner. Directed by Pixar supremo Brad Bird (his first foray into live-action features), Mission: Impossible – Ghost Protocol opens with Ethan Hunt (Tom Cruise) being broken out of a Russian prison by his colleague Agent Dunn (Simon Pegg) and new IMF agent, Carter (Paula Patton). Shortly afterwards, their new mission results in the bombing of the Kremlin and the IMF are promptly framed for the attack, which in turn leads to the President initiating Ghost Protocol, meaning that the IMF is officially disbanded and they're all technically on the run. Seeking to clear their names, Ethan and his team – aided by analyst Brandt (Jeremy Renner) – head first to Dubai and then Mumbai to thwart the fiendish plot of a megalomaniac (Michael Nyqvist) who plans to nuke San Francisco in the name of world peace or something (don't ask). At the same time, Carter seeks revenge on the assassin (Lea Seydoux) who murdered her lover (Josh Holloway), while Brandt also appears to be hiding something relating to Ethan's past. Tom Cruise is 50 next year, but he can still deliver the goods when it comes to running (he is still one of the very best screen runners), jumping, fighting, scaling tall buildings or rolling out of the way of crashing cars; to his credit, he at least has the decency to look a bit dubious about some of the stunts this time round. There's also terrific comic support from Pegg (a perfectly pitched performance), while Patton delivers both punches and pulchritude in equal measure and Renner is excellent as the mysterious Brandt. Nyqvist, however, is a bit boring as the villain, almost as if they forgot to write him any lines. Bird proved with his Pixar movies that he knows his way around an action sequence and he duly delivers some cracking set pieces here, particularly the specially shot, vertigo-inducing IMAX scenes involving the Burj Khalifa in Dubai (see the film in IMAX, if at all humanly possible for the full effect - it's spectacular). He also adds some wonderfully knowing touches, such as the characters actually (painfully) bumping their heads during the stunts or having the supposedly flashy technology break down at crucial moments (this also provides the perfect excuse to ditch the stupid rubber masks). The only real problem with the film is that it flags a bit in the final third, while the last five minutes are actively terrible and should probably have been rewritten. 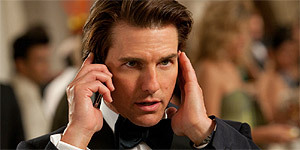 Mission: Impossible – Ghost Protocol is a hugely entertaining blockbuster that's better than any fourquel could conceivably be expected to be. Recommended.